Peppermint Essential Oil is obtained from Mentha × piperita, a hybrid of Watermint (Mentha aquatica) and Spearmint (Mentha spicata). Whilst indigenous to Europe it is found in many parts of the world now, it is very adaptable. 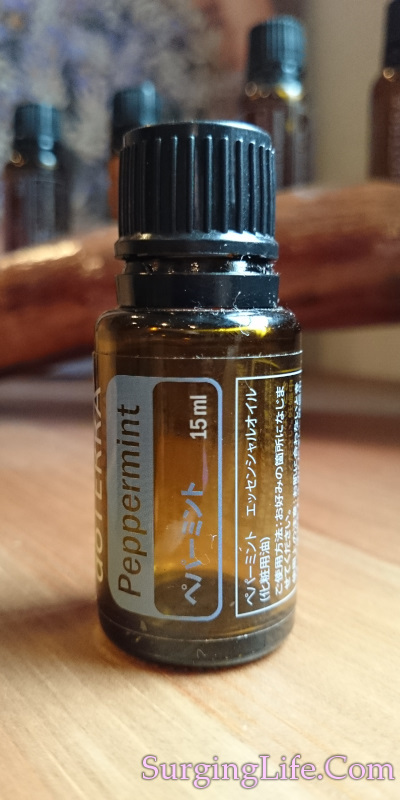 Peppermint has a very strong aroma, one that is very recognisable, yet similar to Eucalyptus in character due to the menthol it contains, as a result sometimes the aroma gets confused. It is cooling and helps alleviate various ailments especially rashes and itchiness. It is also beneficial with alleviating muscle pain. Plus of course it is beneficial for digestive issues. You can discover more below on the Peppermint Essential Oil Uses on how it can do more than just refresh you. Mentha × piperita is a perennial herb of the mint family, which first described in 1753 by Carl Linnaeus after he collected samples of it in England. It grows up to 90 centimeters in height, and has smooth stems that have a square shaped cross-section. The leaves are serrated at the edges, vary between 4 to 9 centimeters in length, and 1.5 to 4 centimeters in width, they are a darkish green with veins that are reddish. The flowers form around July and August and are pale purple in colour. The essential oil is extracted via steam distillation prior to flowering from all parts of the plant that are above ground. The oil itself is clear to very pale yellow in colour, transparent in nature with a thin to watery viscosity. The aroma is strong, sharp and fresh in character with a distinct menthol quality. The principle constituents which yield the properties are menthol and menthone. With other useful constituents being menthyl acetate, menthofuran, 1,8-cineole, limonene, pulegone, beta-pinene and beta-caryophyllene. Peppermint Essential Oil can act as an irritant on the mucous membranes and act as a neurotoxin, so care is advised in connection with cardiac conditions, epilepsy and other similar conditions. It can cause skin irritation with some people, and should be kept away from the eyes. Avoid usage during pregnancy and with children under the age of 7. "Herbal remedies, particularly peppermint, have been reported to be helpful in controlling symptoms of irritable bowel syndrome (IBS). We conducted a randomized double-blind placebo-controlled study on 90 outpatients with IBS. Subjects took one capsule of enteric-coated, delayed-release peppermint oil (Colpermin) or placebo three times daily for 8 weeks... The severity of abdominal pain was also reduced significantly in the Colpermin group as compared to controls. Furthermore, Colpermin significantly improved the quality of life. There was no significant adverse reaction. Colpermin is effective and safe as a therapeutic agent in patients with IBS suffering from abdominal pain or discomfort." Merat S, Khalili S, Mostajabi P, Ghorbani A, Ansari R, Malekzadeh R.
Dig Dis Sci. 2010 May;55(5):1385-90. doi: 10.1007/s10620-009-0854-9. Epub 2009 Jun 9. Peppermint Essential Oil uses around the world are often little known. Many people are aware that Peppermint is good with various foods, or as a garnish, and that it is used in breath fresheners. The oil when using a high quality source can do all these things and many more. It is useful in pain relief for various conditions, it can be used to treat numerous respiratory conditions including bronchitis and pneumonia, and various skin conditions including psoriasis and eczema. Though these are just a few of the things it can be used for. The stimulant and febrifuge effects are easily noted and strong with Peppermint essential oil. Just inhaling the aroma will have you feeling more alert and on the ball, which is great if you are doing things like studying for exams. The febrifuge effect is also notable from inhaling Peppermint oil too, rapidly evoking a cooler feeling within the body. Whilst you get a stronger cooling effect when using it within massage, the effect is highly noticeable from inhalation too. When used topically this cooling effect also serves as an analgesic or anesthetic for the area it is applied too, which is beneficial for anyone with muscular aches and pains, psoriasis and eczema to name just a few things. The pain relief qualities of this oil provide benefit with a great many conditions as can be seen from the list. That in conjunction with the cooling effect makes it highly beneficial for issues such as sunburn , whilst also making it beneficial in treating fevers too. Whilst its decongestant properties also help with treating fevers such as flu, along with other sinus conditions. Peppermint oil is an incredibly powerful oil and use with a carrier oil is highly recommended. Used effectively it will help you with a wide range of conditions and is certainly a good oil to keep close to hand for numerous situations. A quick sniff at home, work or wherever can help ease you away from headaches, or help you to concentrate more if you need to focus on something for work or study. The best results possible from all the Peppermint essential oil uses come from using a high quality source. Whilst there are many options and sources available, quality is noticable very distinctly in terms of the aroma and therapeutic value of essential oils. You can find a good quality source of essential oils here, and more information on other essential oils here.